Great food, fun games, ANTastic prizes and new friends await you at the Social Ecology Homecoming Shindig at the Party in the Park Homecoming festival! Bring the whole family for a Saturday afternoon chock-full of pregame festivities. Say hello to old friends and make some new ones! 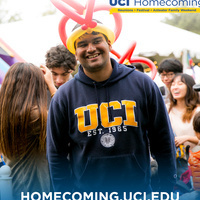 Visit the UCI Alumni website for more details and to register.